My slice came on a plate with a fork, and my first bite had me oohing and aahing and making all sorts of happy sounds. The pastry, buttery and crisp, blended perfectly with the jam and almond filling. If you love almonds and almond pastries, run to the kitchen to bake this. The term “slice” in Australia may refer to just about any sweet treat that is cut into squares or square-like shapes. A Bakewell Slice is a multilayered pastry that’s a variation of the round Bakewell Tart. If you’ve watched The great British Baking Show, Mary Berry baked one as a tehnical challenge. The difference between a slice and a tart is the kind of pan the pastry’s baked in. Bakewell tarts or slices originated in England and migrated to the southern hemisphere many years ago. The countles variations hinge on the type of jam spread on the baked short pastry. 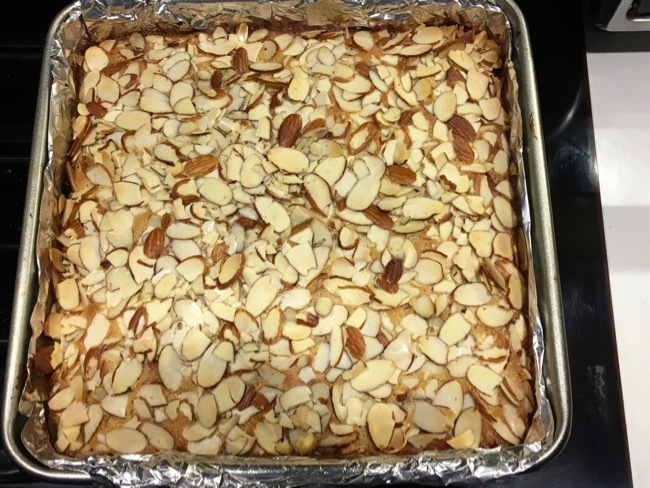 What seems to be always present is almonds: Almond extract, a frangipane of ground almonds, eggs, butter and sugar, and a topping of sliced almonds. 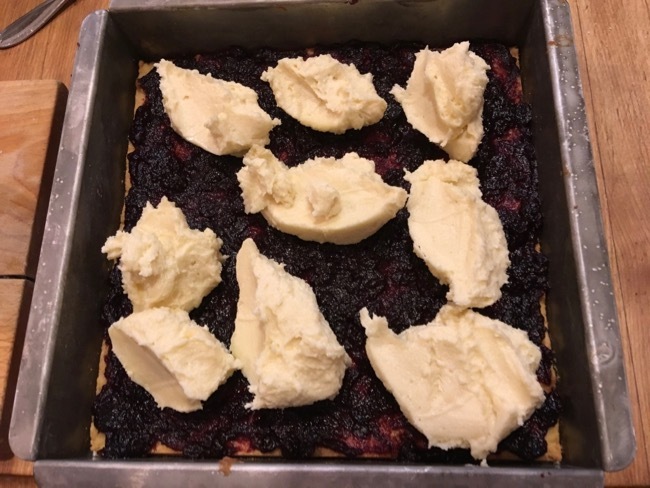 My Australian food blogger friend, Marcellina Cantatore, kindly provided me with her recipe for Bakewell Tart, and I’ve modified it slightly to bake in a 9-inch square pan as Bakewell Slice. The pastry is rich, so serve moderate portions with hot tea or coffee. Marcellina is a great cook and baker and has vowed to bake every recipe from my book, “A Baker’s Odyssey.” Do visit her delicious website, https://www.marcellinaincucina.com. I made the Bakewell Slice you see in the opening photo of this post in Australia in the kitchen of Jenny Graves, a dear lifelong family friend. She happily provided her homemade raspberry jam. Here are a few step-by-step pictures. What’s this? 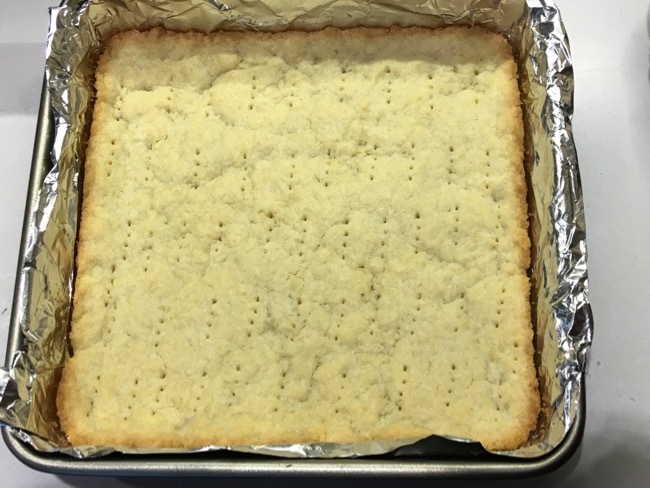 The clumps of short crust pastry dumped into the foil-lined baking pan. I’m showing you this so that you don’t overprocess the pastry into one lump. I’ve given a range of water to mix with the egg yolks. Use the smaller amount. Then if the pastry seems too dry, pulse in the last tablespoon of water. And here’s the pressed-in-the pan short crust, pricked with a fork as directed in the recipe. Notice that pieces of butter are nicely visible. The baked crust for Bakewell Slie. Pale gold on top with darker edges, just as it should be. After you’ve spread the jam on the baked and cooled crust, make the frangipane and put dollops of it on the jam. Spread frangipane to make an even layer. Then sprinkle with sliced almonds. 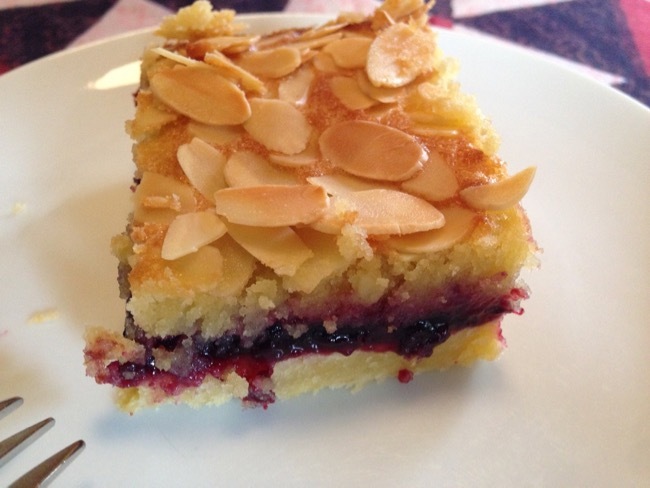 The baked Bakewell Slice. Notice that in the gaps between the sliced almonds, the frangipane layer is nicely browned and the almonds are lightly toasted. Cool completely before lifting the Slice out of the pan with the overhanging foil, peel away the foil, and the slice is ready to be cut and served. In a 9-inch square baking pan, the slice is about 1-inch-thick. Cut into small bars for hand-held treats. Serve squares on plates with forks. The pastry stays fresh for a few days at room temperature. Bakewell Slice may be made ahead and frozen for up to one month. For the pastry, adjust an oven rack to the center position and preheat the oven to 375 degrees. 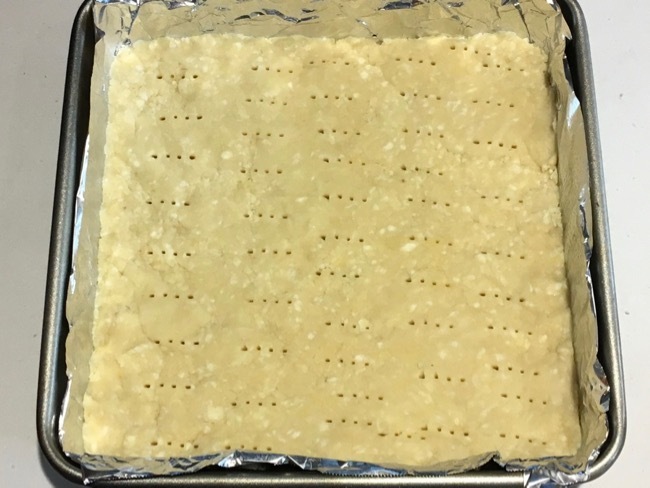 Line a 9 x 2-inch square baking pan with a square of aluminum foil and coat lightly with cooking spray. If not weighing the flour, sift about 3 cups onto a sheet of wax paper. Spoon the flour lightly into a 1-cup dry measure, fill it to overflowing, and sweep of the excess with a straight edge. Transfer the flour to the work bowl of a food processor fitted with the metal blade. Repeat to measure the second cup of flour and add it to the processor bowl. Add the sugar and salt and process 5 seconds. Add the cold butter pieces to the food processor, and pulse the machine 5 or 6 times just to cut the butter into smaller pieces. Combine the yolks, almond extract, and 2 tablespoons ice water with a fork in a small cup. Start pulsing the food processor as you add the yolky liquid through the feed tube. Pulse rapidly about 10 times (or more) to make a moist, clumpy dough. You don’t want the dough to gather into one ball. If the dough seems too dry, pulse in the third tablespoon of ice water. Dump the clumps of dough into the prepared pan and press firmly to make an even compact layer. Prick all over with a fork at 1-inch intervals and place the pan in the oven. Bake 30 to 40 minutes, until the crust is a pale golden brown with darker brown edges. Remove from the oven but don’t turn the oven off. When the crust is cool, spoon and spread the jam in a thin layer onto it. For the frangipane topping, beat the butter and sugar together for 3 to 4 minutes with an electric mixer until creamy and fluffy. One at a time, beat in each egg until thoroughly incorporated. On low speed, beat in the almond extract and almond meal. The frangipane will be soft but it will hold its shape in a spoon. Place the frangipane in dollops all over the jam and spread to make an even layer that covers the jam completely. Sprinkle evenly with the sliced almonds and return the pan to the oven. Bake 30 t0 40 minutes until the frangipane is lightly browned and the almond slices are toasted. Cool completely on a wire rack. Lift the whole cooled pastry out of the pan by the foil edges and carefully peel away the foil. Cut into portions and serve on plates with forks. 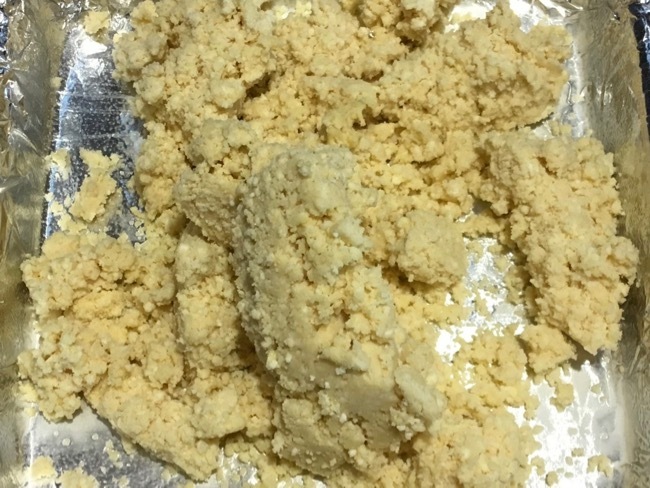 Makes 9 squares or 18 bars. What a luscious treat! Thanks for making it at our house. Happy to spend such quality time with you and Owen, Dianne. I can’t thank you enough for sharing your splendid recipe with me, Marcella. Can’t wait to make this. It just sounds lovely! It’s a taste of heaven, Kay. So glad you liked the bakewell slice, Joanne. Have fun baking it!